Although we're only at the beginning of February so far it's been a very busy month. Last week both our boys did their grading for their next belts in Little Dragons, which is the childrens class at Sheffield Dragons. Peter passed and is now on his second belt, Luke also passed and very proudly told us all he's getting a new belt. They had their presentation on Friday night where they saw Sheffield Dragon Cadets do a show and also one of their teachers (and Peter's hero) Kady Robinson performed. Kady has recently gained her Black Belt 3rd Dan so HUGE CONGRATULATIONS Kady from us all. These photographs were taken that night, the boys couldn't wait to try on their new belts so it was like wrapping stiff cardboard around them! (They've since been through a wash twice to soften them ready for Wednesday's class) Peter is the one on the left, he's 5 and just been awarded his yellow stripe. Luke on the right is 3 and just gained his first belt, the red stripe. Luke is very shy and doesn't have a lot of confidence so we were nervous about him actually doing his grading and then going forward to receive his belt but he surprised us all....we're hoping it'll give him more self confidence for when he goes into 'big school' next year. Congratulations to all the other Little Dragons who graded and were awarded their new belts last week. Stitching wise I've not done much, been too busy running around after the kids and car problems. Yes, my car ended up in the garage yesterday having all new brake discs and pads all round....argh!! Now we've got to sort out new tyres on the front...they don't tell you when you're taking driving lessons that actually running a car is sooo expensive. I've been working on a couple of exchanges but can't post photographs until they've arrived at their respective new homes. I've also been working on my gift SAL which is coming along nicely but not as fast as I'd hoped. I have completed February's calendar square though at the moment the weather isn't quite like this LOL! We're back to snow watch here in Yorkshire, it hailed so heavily today as I got the kids home after school that we had to sit in the car until it calmed down. Incase you're wondering...yes the photograph at the top has changed. This one is a scene over Derbyshire that DH took last year. He's taken a lot in the last couple of months but most of them have snow featuring and I though it would be nice to have some sunshine to cheer us all up and make us remember that it won't be long before the snow is gone and the sun is back. Also to everyone who has asked about the "Old Books" chart on my last stash shopping...The chart is one of The Cricket Collection, No. 132, called "Old Books" and designed by Vicki Hastings. 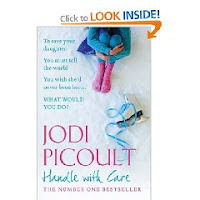 I'm not doing too bad on my book challenge, I've nearly finished Jodi Piccoult's "Handle with Care" it's a lovely book of a difficult subject. I've just downloaded my "Up and Down the Dales" audiobook by Gervase Phinn so tonight I'll tuck up with my headphones on. Thank you for all your lovely comments about my stitching and children. It is a big encouragement to keep trying new techniques and projects. I hope to post a photograph of my Darcy photostitch next week, she's been sadly neglected this week as the very few hours I've had to stitch have been on deadline projects. Lovely pictures Jo, it shows the boys 'in action'. Hope you are not snowed in, we only had a very small amount of flurries. Congrats to your sons on their new belts. Both boys are very handsome. Your stitching is very lovely. Congrats to your boys on getting new belts. Like the calendar squares, where did you get them?? Congrats to the boys!! Stitching is great! Congratulations to both of your sons. Your stitching is looking lovely. Congrats on the finish and a BIG Congrats to the boys.